I'm getting really tired of the dentist's chair. 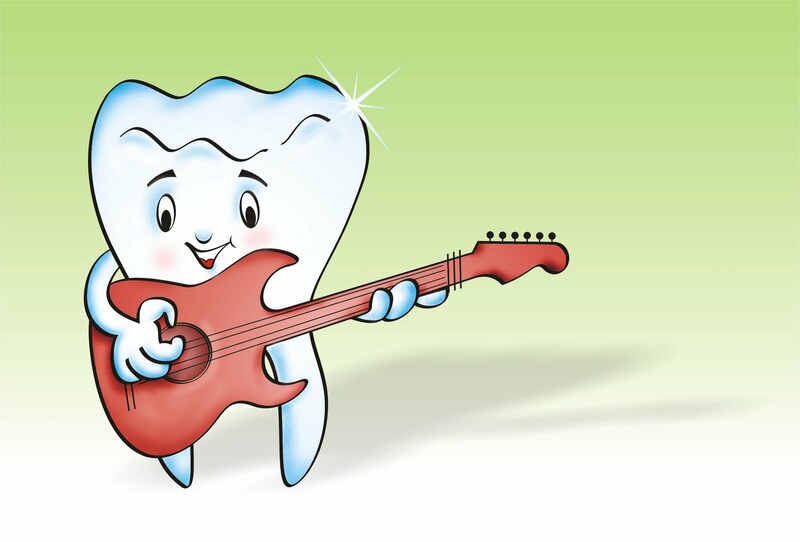 I had to drive another 70 miles to the Oral Surgeon again today because I'm having problems with the implant that isn't even completed yet! I won't rehash the entire procedure, but if you're curious enough you can read about it here. I don't blame anybody. Stuff happens. I've learned to roll with it, but this is getting frustrating. As much as I want this done, either alternative doesn't sound like much fun. I'd almost rather eat spinach than have to endure more shots to freeze the most sensitive part of my mouth. Almost. Hey... maybe I could record the whole thing and become a YouTube sensation! Nah, I'm not much into videos and home movies. They tend to disappear. The one good thing about traveling north for dental work? They have a Biggby Coffee Shop. Now that's worth the trip. Numbing dental pain with coffee... one cup, one tooth at a time. Maybe it's not so bad after all. At least until I get the bill. This morning, my head is still reeling with some of the fantastic "wow" moments I had at Pacesetting Church Leadership School in Lansing a couple weeks ago. A few simple truths have already made a huge impact in my personal walk and my ministry. Pastor Dave gave us a copy of his book "Emerging Leaders," where he wrote that he has previously given students an assignment to write down 50 things they want for their lives and ministries over the next 10 years. Trouble is, he says many students couldn't come up with 50! Well, I got to about 35 right away, and by week's end I had my 50 all filled out. It's really helpful to have it all down on paper. Writing the vision down clarifies my goals, and helps me have something to "shoot for." The dream becomes a plan. The plans will become reality. I can't wait to start checking off a few. But the biggest "wow" moment was learning to walk in Kingdom Authority... where we live in the authentic, not the synthetic. Everything authentic is God-made. Synthetic is man-made. Synthetic says, "Thou must have stained glass windows or the Holy Spirit shall not showeth up in thine service." Synthetic says, "Thy men must weareth a tie and thy women must weareth skirts that covereth their ankles." But it also says, "You gotta water down the word and tickle their ears, or they're not gonna come to church! Just tell 'em Jesus loves them but don't tell the truth about all that other stuff. Give 'em what they want, not what they need." 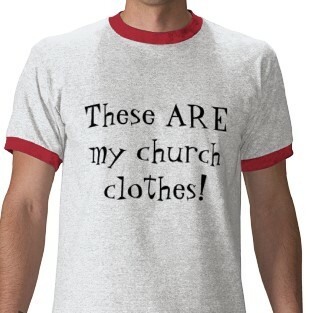 It also says, "Lose the shirt and tie... wear blue jeans or they'll think you're a hypocrite and a money-grubber. Gotta relate to the people!" Synthetic people follow a human formula for success. Authentic Christians follow Jesus. That's exactly what the Bible says the end times will be like. We're there now. We're living in a synthetic society. And synthetic is man-made religion. The Pharisees were synthetic. Jesus is authentic. I want to be authentic in my walk and ministry. Walking in Kingdom authority means we can pull heaven down to earth when we live as authentic Christians... studying the Word, worshiping, fasting and praying daily. When we live outside Kingdom authority, we make it difficult for God to bless us or reveal fresh vision. So, I'm back in a shirt and tie on Sunday mornings. Why? Because I feel better about myself, that's who I am, and I preach better when I feel better. I won't pretend to be someone I'm not for the sake of man-made church growth formulas. Our church will go out of its way to welcome the tattoo-covered seeker in jeans and a t-shirt. We will preach the whole truth; the authentic word of God in love. Worship will be about Jesus, not the fact that the hymnals are collecting dust and cobwebs on a basement shelf. Authetic... not synthetic. That's #51 on my list. Check! Come on guys... admit it. 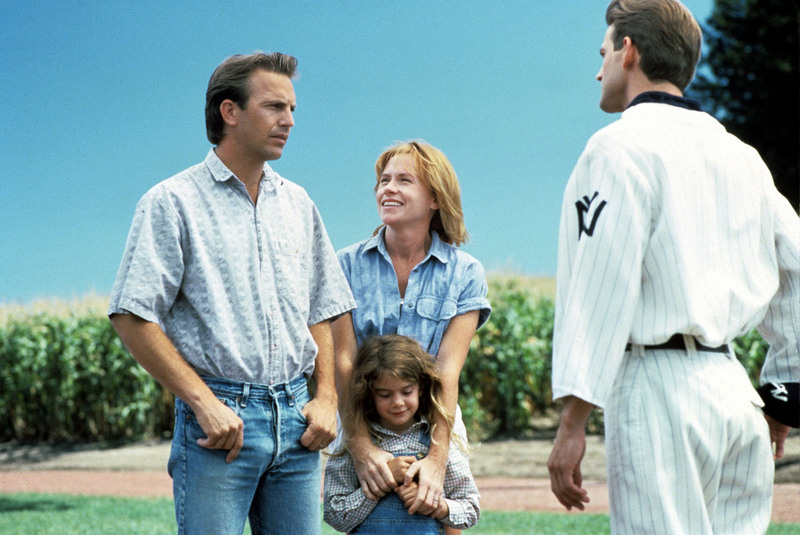 You choked up at the end of "Field of Dreams." It's okay, me too. But then I'm an exceptional case. I do the same thing at the end of "Sleepless in Seattle." But man... when Ray gets to ask the young, starry-eyed ghostly apparition of his Dad if he wants to play catch with him, what guy doesn't think of his own Father? There are two schools of thought here. The first: "Gosh, I wish I could play catch with Dad again like we did when I was a kid," or "My Dad never played catch with me! I only wish..."
I fall into the second category. Mr. Townsend next door was the one who taught me to play ball. He was a surrogate Dad in a lot of ways, even though he could be terribly brash with me. But I'm thankful he was in my life. I have mixed feelings on Father's Day, mostly because my memories of Dad are clouded with a lot of pain, and also because it's a bittersweet reminder of all that I'm missing with my kid. Zachary and I have never played ball. Because of his autism and other disabilities, his idea of a good time is spreading a blanket on the ground and running around on it by himself... over and over and over again. Dad isn't invited to the party. When he was 4, he had a grand mal seizure on Father's Day. I still remember the nurse saying, "This isn't much of a Father's Day for you, is it?" But you know what? My Dad loved Jesus. He loved his country. In his own funky way, he loved his family. I know that even at my age, I still have a lot to learn about being a good father, husband, and Christian man. Can I hold my Dad responsible today for mistakes he made when he was 15 years younger than I am now? The bigger question, "should I?" The answer: Of course not. Every day I wake up and see my Dad in the mirror. I look like him, and there's nothing I can do about it. I just don't want to repeat his mistakes. So whatever was in my Dad that was good, noble, trustworthy, and of good character, I hope to emulate. And a tip of the hat today to Mr. Townsend. Here's hoping I can be just as good a surrogate to my Godchildren. And here's hoping there are baseball mitts in heaven. I'm holding out for a catch with my Dad. With three full days of Church Leadership School completed, my mind is on spiritual overload. The same could be said of my heart. This will undoubtedly be another landmark moment that I'll always remember as a time that the Lord spoke direction clearly into my life. When classes concluded this afternoon, I wanted to take some time to get away and just pray for a while. Mt. Hope Church has a beautiful garden called, "The Valley of Blessings," based on II Chronicles 20:26. Look it up. *Insert grin here* I sat down in a quiet area to pray. To my left was a small fountain with water gently cascading over some colorful rocks, and to my right and directly in front was a walkway made of assorted gray slate stones. Now... God has really been opening my eyes this week to the Biblical idea of vision. Not only what it is, but how to seek it, get it, and implement it. I've heard amazing stories of heaven touching earth, and how ordinary people can call on our extraordinary God. So as I watched the water cascade, the Lord told me, "Your heart is like that stone. The water will eventually wear the stone down, but it will take many years. Do you have that much time?" Whoa. No, I don't. I've always felt like I'm on a fast track in ministry, making up for wasted years that I spent wandering in my own personal desert. So God, what do I do? Then he pointed me to three of the slate stones, all adjacent to one another. "See how the first stone is cracked in half?" said God. "It's ugly. It stands out from the rest of the beautiful slate. It's damaged. But I can take that damaged stone and not only repair it, but make it brand new. Do you believe that?" Yes, God. I get it. "Okay," He said. "That stone represents the hardness of your heart. It has broken you. Now. Look at the second stone. See the small chips sitting on top of the stone? Small layers, almost as thin as paper have been sheared away. But look underneath. See how shiny and beautiful the stone is beneath that protective layer? That's what I can do for you... peel back the layers of hurt and self-doubt, the condemnation and the wear that's bringing you down. Son, there's beauty underneath all that hurt. It's the hurt that's keeping you from growing. It's the hurt that clouds the skies so you can't see my vision. It's the hurt and the self-condemnation that didn't come from me that has put a shield around your ministry. Let me peel it away for you." Wow God... okay. How do I do that? "Look at the third stone," he said. "It's perfect. There's no dirt, it's shiny, and there are no chips or cracks. That's how I created it... that's how I intended it to be. It's attractive. I look at that rock and smile. I feel no pity, no doubt, no, just pride. Pride in my creation. My question to you is... are you willing to allow Me to be all that you have wanted Me to be for so long? Will you let me peel back the layers and expose the beauty underneath? Will you get out of my way, Son?" If nothing else, this week is challenging me to be authentic, not synthetic. Synthetic is man made. Authenticity comes from God. Only the authentic is created by Him. I want to live authentically. I want to be so much more for Him. I want to be that perfect stone. I held the door for two little old ladies at a Denny's Restaurant tonight. But I really wanted to let it slam in their faces. Sounds cruel, I know. I'm exaggerating, but really I was very upset. They were complaining to the waitress at the checkout about their undercooked fish, and then about the price of their meal. They kept on complaining until they got a manager to point out that the price they were charged was indeed correct. But she discounted them anyway. All the while, a little 5 or 6 year old girl was doing what little girls do... making some little girl noises behind them. One of the women turned around and told her to be quiet because they couldn't think! (Translation: Shut up kid, I'm trying to get my #@!& discount). "Where is her mother?" the other octogenarian asked. "You're not a very good little girl are you?" the other accused her. Now. I just preached Sunday about turning the other cheek. Jesus said that if someone strikes you on the right cheek, turn to him the left also. If someone strikes you on the right, it's most likely that you've been backhanded... a particularly insulting strike. It means you've beeen offended. No, the women didn't insult me personally, but I felt very angry that they would treat the restaurant employees and a little girl in that manner. As I checked out, I gave the waitress an extra nice smile and thank you, and left the restaurant just ahead of the discount ladies. It didn't take long for the Holy Spirit to remind me to live above the norm. I held the two doors open for the ladies, they thanked me, I smiled through my anger and left. No, I'm not exalting myself. Far from it... because my heart wasn't really in it. I found that I have a long way to go to show love to others. Deep down, I wanted to tell those ladies off. But I also know that vengeance belongs to the Lord, not me. If God gives them indigestion or food poisoning from their undercooked Tilapia (not that I'm suggesting He do that, you understand) then I defer to His wisdom and judgment. We were reminded at Church Leadership Class today that there are Kingdom principles at work. Pastor Dave put a much finer point on the teaching that I've been repeating often lately in to my congregation: God's blessings are found in our obedience to Him. Today, I resolved to take it to a higher and deeper level. I just didn't expect the first test to happen at Denny's. It was the best of books, it was the worst of books. And I've given up on it. I admit it... I just don't understand "A Tale of Two Cities." I've been picking away at it since sometime in January, and I finally admitted to myself that I'm not going to get through it anytime soon. I had an easier time with Shakespeare back in High School. There are a few breakthrough moments where Mr. Dickens' writings cause my jaw to hit the floor... the poetry and prose are just that good. But I'll be doggoned if I understand a word of it. So, I'm back to reading my favorite classic, "To Kill a Mockingbird." I vowed I would read four classic books this year. I don't recall absolutely stating they would be four classics I'd never read before. Although, I suppose that was the intent . Here it is the first week in June, and I'm finally on track again with my New Year's Resolutions. By now, I had hoped to have reached my weight goals, have surpassed my expectations by having read 12 or more classics, and be well on my way to reaching the other two unspokens. How's that working for me? Not so good! By the first of the month, I was one pound over my 2011 beginning weight, and Mr. Dickens seemed to have me permanently stuck on book #4 for eternity. But you know what? I feel renewed. Maybe it's a sense of frustration, or maybe it's just the break in the weather. I finally feel "on track." I've lost 5 pounds this week, and actually feel the confidence that I can get my eating habits back on the track I strayed from. Believe me, I can tell when my self-confidence is waning, and when it's at its peak. I finished up my internship for ministerial ordination, and I'm off to Church Leadership School for a week starting tomorrow: Both part of my two aforementioned unspoken resolutions. So, time will tell. Check back in September and we'll see how it goes. Does anyone have a copy of War and Peace?